Today over in Herald Square there was a single suitcase left on the sidewalk in front of Macys, and the police shut down an entire block and brought in the bomb squad only to find out it was a piece of abandoned luggage. Phone alerts went out citywide that the area was being evacuated. Dozens of firemen and police vehicles and at least 4 helicopters responded to the scene. 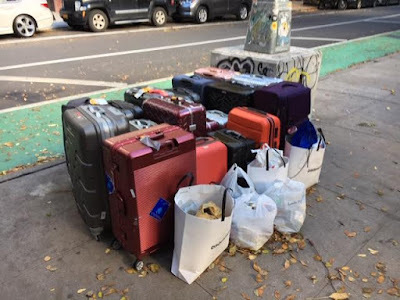 Meanwhile in the East Village, someone left a dozen suitcases on the pavement, and the only thing that happened was that it was noted on EV Grieve for everyone to gawk at. As the homeless street population increases this is going to become a huge problem for the NYPD. There are lots of people sleeping on 34th st. It looks like these tourists are leaving with more than they came here with. It also looks like there's another apartment that's not being used as it should for full time residency. This will supposedly change when that Moxy opens. In the good old days, it was pairs of shoes tied together by their laces and thrown over a wire strung between two buildings across the street from one another, or hung in front of a building, signifying that was a place where drugs were sold. Now it's piles of suitcases in front of a building signifying that the landlord is breaking the law and warehousing rental apartments to fill with many transient tourists instead of long-term tenants. Our landlord is doing a good job of filling the building with transients. I'll say it again. Rent Stabilized apartments should be reserved for citizens and legal residents. The whole system was put in place so Americans could work for the war effort free from greedy landlords. We are still at war and now the greedy landlords come for all over the world to literally kill us and throw us out into the streets.